Consumers have more ways than ever to communicate with the brands they buy. Many companies are leaning on early-stage AI tools to deliver hyper-personalized customer experiences, while automating tasks and enabling human workers to focus on what really matters. 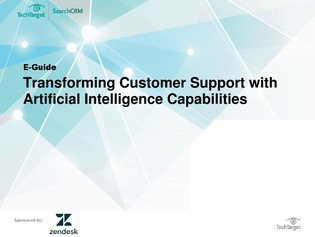 In this e-guide, learn about the evolving role of AI in CRM and how chatbots can help enterprises transform their customer service functions. You’ll also uncover how AI technologies use customer data to provide valuable insights into emotions, buying behaviors, identities and more to help you take action.